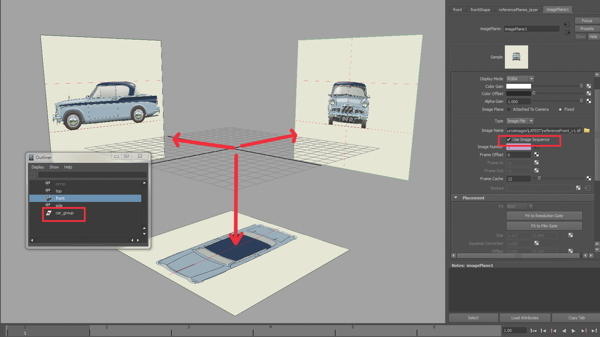 This tutorial, created for 3D Artist magazine explains how to model a classic car in Maya, with a focus on hard-surface modelling techniques. for 3D Artist. The tutorial was created in 2014. Create a new scene and navigate to the Front orthographic view. Reset the camera by going View>Default View in the Viewport panel menu. Now go to View>Image Plane>Import Image and select ‘referenceFront_v1.tif’ when the Open screen pops up. Open up the Attribute Editor and check Use Image Sequence, then take the Alpha Gain down to 0.4 also. Move to the Side orthographic view and set it to Default View. Import ‘referenceSide_v1.tif’ and give it the same settings as the front image. Do the same for the top view, loading in ‘referenceTop_v1.tif’ as the reference. Once all three reference planes are in, check that they line up in the Perspective view. Using the Center attributes for each image plane, push them all along their corresponding axis so we have space to model in the centre of the world space. The reference has been set up in a manner that allows us to use the timeline to switch between the original image, the topology draw-over and a coloured draw-over indicating the separate pieces. Set your Animation Range slider to go from frames 1 to 6. Now if you scrub between frames 1 and 3, you will view the front of the car and frames 4 to 6 will reveal the back. To rotate our model to match this, create an empty group node by hitting Cmd/Ctrl+G. Rename the group ‘car_grp’ and set a key at frame 1 and frame 3. Now scrub to frame 4, put a value of 180 in its Rotate Y channel and set another key. Every object we create (excluding lights) will be placed in this group so it follows our reference correctly. Go to Create>Polygons Primitives and create a plane. Under its Inputs in the Channel Box, take down its Subdivision Width and Height to 1. Now position and orient it against the side of the car. Go into Edge mode and use the Extrude tool found under Edit Mesh to begin blocking out the main base. Use large shapes to fill out the silhouette as much as possible with as few polys as you can. I’m a big fan of Edge Modelling but there’s no reason why you couldn’t use a box modelling technique to rough out the form if preferred. Continue to block out the base in the front and top view and also importantly, check your model constantly in the Perspective View. At this stage, you’ll probably find that the reference does not line up completely. In a situation like this, I like to decide on one key image, in which I will line everything up and the remainder of the images will act as more of a loose guide. As well as extruding edges I like to use the Insert Edge Loop Tool found in the Edit Mesh menu tab. As long as the model is in quads, this will cut through cleanly. As you add more detail, make sure you try to keep the faces of a similar size to one another. To reduce our workload and get a better feel of a complete car, let’s mirror the model over. First, turn on the Translate tool and hit the Insert key (or hold the D key) on your keyboard to be able to edit the position of the pivot. Now hold the X key on the keyboard and grid snap the pivot to the X-plane in the Front view. Hit Insert to come out of Edit Pivot mode. Next, go to Edit>Duplicate Special (Options) and set the Geometry type to Instance. Scale in X to -1 and hit Duplicate Special. As we go through the modelling of the car, we will be using this method many times. Start blocking in the door and the roof panels. Again, I’ve begun each piece with a single plane and extruded or added edge loops for more detail. To get the flow between the separate elements working well, I’m holding down the V key on the keyboard to point snap the border vertices of the door and the roof onto the main base. Once I’m happy with the initial blocking, I’ll use the Duplicate Special to mirror the geometry over. To get the window rims in place, draw a curve using Create>CV Curve Tool. 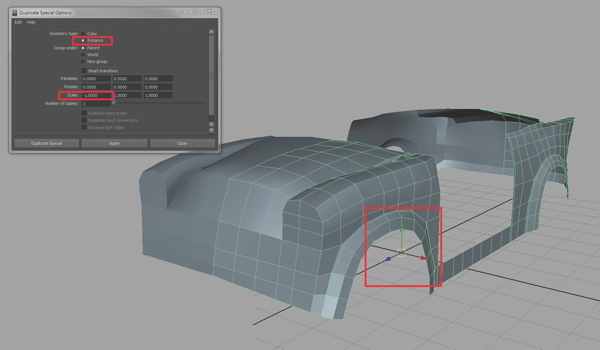 Holding down the V key on the keyboard, point snap each CV to a vertex of the window and the base of the car. Next, create a polygon cube and shrink it down to be similar to the size of the rim. Now place it at the beginning of the curve you have drawn and go into Face mode. Select the face that’s adjacent to the curve and also Shift-select the curve. Go to Edit Mesh>Extrude, increase the Divisions to around 20 and the extrusion should grow along the curve. Continue to create the front window rim and the side window rim using the same technique. Once the window rims are in, create some windows using polygonal planes as well as placing the front window frame. As you move around the model, continue to check the car from all angles, smooth out the flow of the edges and keep the model as clean as can be. At this stage, I would select all the geometry and go Edit>Delete By Type>History. Deleting the history frequently will keep our scene file nice and light. You can also delete the curves used to create our window rims as the link-up between them and the polygon faces have now been broken. 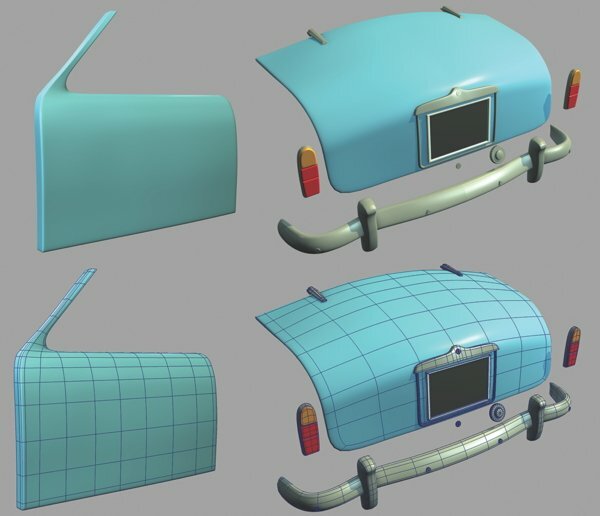 To create the bonnet, select a range of faces from the main base of the car where the bonnet should be situated, then go to Edit Mesh>Duplicate Faces to make a copy of those faces. This enables us to get the flow between the main base and the bonnet working well. Add some tight edges around the border of this new piece to add some solidity and depth to the bonnet. Later on, we’ll reuse this for the boot panel of the car. For the bumper, begin with a default cube and insert edge loops to match it closely to the reference image. The bumper can also be duplicated and used at the rear of the car. At this stage, the initial blockout is acceptable, though much tweaking will continue and we’ll begin to add some of the key details that make this car distinct. For the headlight, begin by selecting some faces at the front and extruding them into the car. After some point-pushing to get this region as round as can be, place a semi-sphere into the cavity. 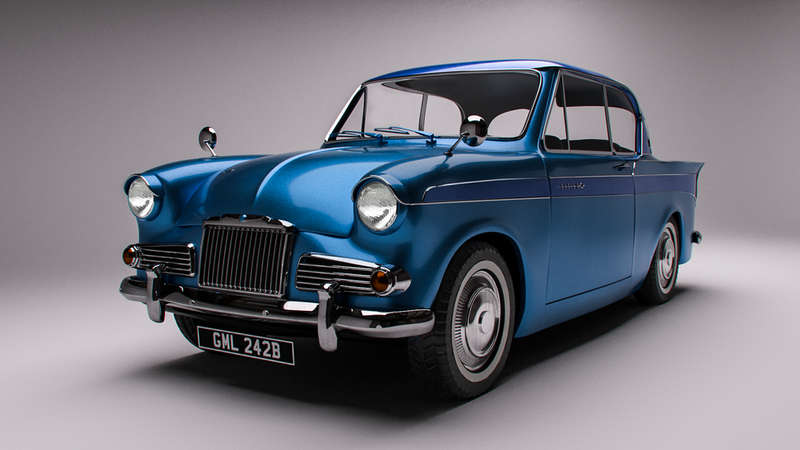 Further basic polygon cubes can be shaped to form the Rapier’s eyelids and some tight rims around the headlight to sit it in more realistically. The grill and indicator lights can also be pushed from simple shapes such as cylinders, cubes and spheres that are refined by adding edge loops or extrusions. 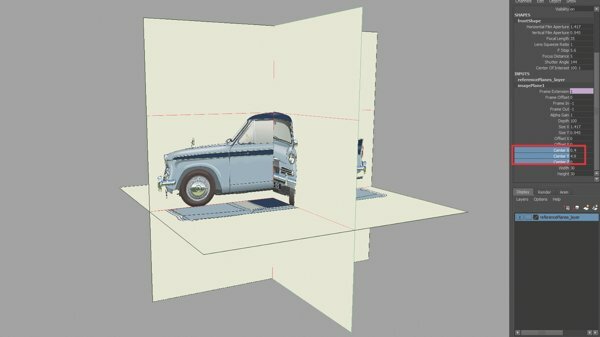 To get them to sit flush against the front of the car, use a Lattice Deformer from the Animation panel. With the lattice points, you can quickly and effectively reshape the mesh. The hubcaps, although they may look pretty complex, are very quick to create. First shape a cylinder and delete all the faces other than the top, then add extra edge loops to help define the areas that will need pulling out or pushing back. These sections can then be extruded out and the entire model smoothed using the Mesh>Smooth tool. Select a row of faces, disable Keep Faces Together under Edit Mesh and perform another extrude. This time, scale in the faces in X and Y and extrude the new faces inwards. Finally, to get rid of the roundness of the detailed areas, add to two edge loops around the recessed areas. The tyre is created from a Torus shape and under its Inputs you can use the Section Radius to help block out the initial shape. Adding extra edge loops will help to reduce the element’s softness. To create the distinct wings of the Rapier, extra edge loops are needed. As we don’t want all the edge loops to cut through the side of the model, we’ll use the Split Poly tool. Extruding out from the back of the wings also enables us a base to sit the rear lights on and adding a tight edge in the region helps to hold the unique shape when smoothed. Next you can hollow out the boot, as it would be in a real car. This will also enable us to sit the boot door nicely into the cavity and create a believable tight shadow in between the surfaces. Now that we have our main forms in place, we need to start adding some solidity to them and give them some thickness. To do this we need to bevel the edges of the components. Begin by adding tight loops around the main base and the window frame then extrude out the outer edges and pulled them in. The metal rims around the window frames will also need a bevel added to them. Leaving them without a bevel either makes them too flat in unsmoothed mode or too rubbery in smoothed mode. For the roof, select all the faces and make a large extrude inwards. This enables us to use the depth of the roof to rest the side windows against. Now simply continue to bevel the door and the bonnet of the car. The lights at the rear and the majority of the metal work around the car also can have their edges bevelled. This will help the light hit the edges and create nice highlights adding to the overall believability of the model. To add some richness to the model, it’s important to add the finer details, such as the strips running along the model and the logo on the door. We can also use some simple geometry for the side mirrors and model the window wipers and the door handle. Once we’re happy and have tweaked to our hearts’ content, we can delete the duplicated side. Again, use the Duplicate Special option to create the missing half, only this time set the Geometry Type to Copy in the Options box, or use the Mirror Geometry tool found under Mesh. If you are using the Duplicate Special tool, you’ll need to combine the individual halves by going to Mesh>Combine and then merging the centre vertices that are sitting on top of one another.